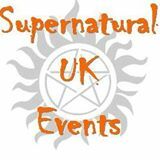 Many UK SPN related events are listed on the Convention Calendar or in the News section on the Supernatural in the UK wiki page. Many events listed are past events and are archived here for information. Please note that some Facebook groups may be defunct. If you have a past event that you would like archived here, please get in touch via the discussion page at the top. The SPNFamily in the UK is a dedicated, loyal and crazy bunch. Would you like to meet some of us? - Supernatural UK Fans organising fun events dedicated to our favourite show. Starts: 25 October 2014 at 10:00 am. Check out the event page on Facebook for more details. Supernatural Shiverpool MadnessSupernatural UK Events hosted a meet-up in Liverpool on Saturday, 1 February 2014. Check out the Shiverpool Madness FB Page for details. Manchester MeetSATURDAY 16th to SUNDAY 17th November 2013 - Fans will be meeting up during the day, watching Sweeney Todd at 8.00pm, followed by drinks in Manchester town center afterwards. Check out the Manchester meet FB Page for details. - 26 October 2013 - Join Supernatural Fans for spooky Supernatural goodness. - 17th August 2013 - An SPNFamily meet up in York, for Sightseeing, Dungeons visit, Food+drinks, Ghost walk & Past time group photo. - on 6th July 2013 in Nottingham there was a Supernatural fan Cosplay meet up.